Now is not the time to falter. 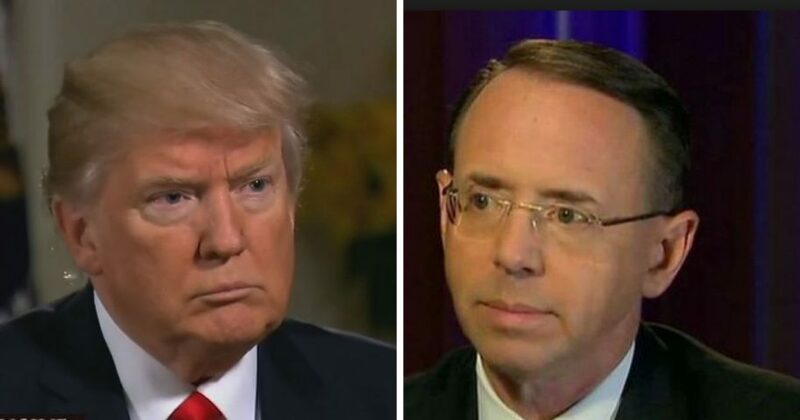 Trump should use the opportunity he is being handed to get rid of Deputy Attorney General Rod Rosenstein once and for all. The president should not be conned into keeping him. By suggesting — in jest or not — that he wear a wire while speaking with the president, by discussing a legal coup d’etat through the 25th Amendment, and by the loose reins he has given special prosecutor Robert Mueller, Rosenstein has shown himself to be Trump’s mortal enemy. Disloyalty doesn’t begin to describe it. Until now, it has been politically dangerous for Trump to fire Rosenstein and hazardous to suggest a replacement. But now, Rosenstein’s pathological hatred of all things Trump has carried him over the edge and given the president the excuse he needs for termination. And waiting in the wings is Solicitor General Noel Francisco, the next in line at the Justice Department after Rosenstein, who Sen. Ted Cruz reportedly suggested for the Supreme Court vacancy that Judge Brett Kavanaugh was nominated to fill. Francisco would be loyal to Trump. His record suggests an ideological affinity and a partisan sense of identity. For Trump to believe that he can still work with Rosenstein, and even control him now that his fate rests so clearly in the president’s hands, is delusory. The Mueller investigation into Trump’s supposed collusion with Russia has run out of gas in the middle of its journey. Mueller has convicted Paul Manafort and forced Michael Cohen into a guilty plea. But the fraud Manafort committed in Ukraine and the payments Cohen used to silence Stormy Daniels have nothing to do with Russian meddling. These are simply placeholders to convince Washington that Mueller still has a role even with the total absence of information about his primary task: to investigate Russian collusion with Trump. It’s important that Trump not use the current Rosenstein imbroglio to fire Mueller. Let him run out of gas and be stranded. Don’t make a martyr of Mueller. Don’t let the left add to its mythology that the election of 2016 was lost because of Russia. Expose the bankruptcy of the charge by letting Mueller follow through and falter. And then, use a new deputy attorney general aggressively to attack the other matter from which Attorney General Jeff Sessions has recused himself — Hillary Clinton’s emails and “pay for play” at the State Department. Investigate the FBI and the DOJ. Get testimony from Bruce and Nellie Ohr, grill Lisa Page and Peter Strzok. Indict former FBI Director Andrew McCabe and investigate the real scandal in Washington: The attempts of the Deep State to overthrow the elected president.